What a difference a week makes! Now that I’m down to only a handful of outfits, it should be easier than ever to tell how much my shape is changing. I think I look considerably more pointy than I did last week, and hopefully this is because the baby has descended a bit. And I have to be honest: I kind of love being this huge. Because I am growing so gradually, I don’t ever really feel like I can tell a difference, until I look in the mirror or see a picture, at which point I think, “Whoa! 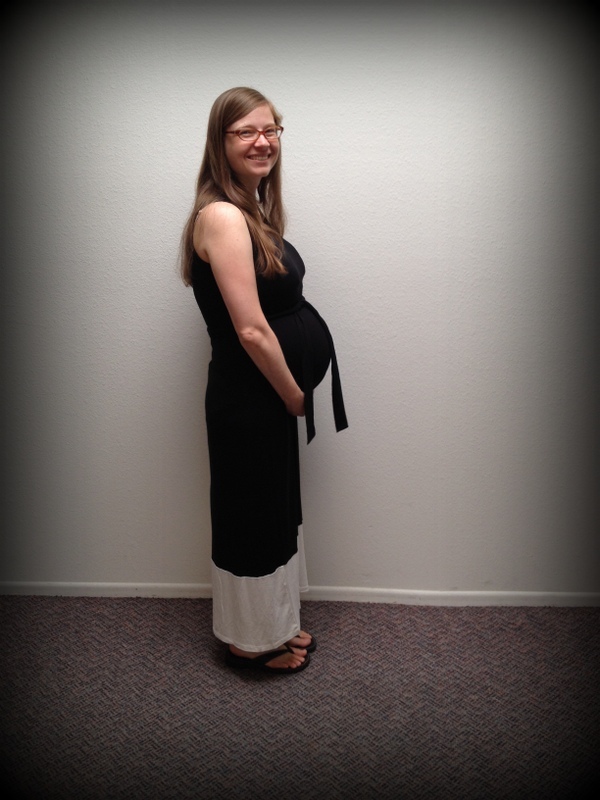 I am seriously pregnant!” I also kind of enjoy the “pregnant lady coming through” kindness of others. Miraculously, I am still feeling great. I am certainly waddling, and picking things up off the floor is a thing of the past, but otherwise I feel about the same. Mild heartburn, a bit of increasing insomnia, occasional pains from kicks or punches, but all of this feels very manageable to me. I’ve also started having some Braxton-Hicks contractions, but they don’t hurt at all, and I’m happy for my uterus to get some practice for the big event. My ankle swelling even went down! I think a combination of swimming and drinking even more water than usual deserves the credit, but I will say that I’ve never been happier to see those pointy ankle bones. As far as the insomnia goes, I am usually up for about an hour and a half during the night. This has gotten easier to deal with since I’ve just decided to get up and read rather than tossing and turning. And I am sure it is good practice for the nights ahead! I have not even been feeling especially tired lately–some days I nap for an hour, but never more than that. I am amazed at this eleventh hour burst of energy. It’s being well spent. This weekend we made a lot of progress on prepping our room and the nursery for furniture moving: consolidating things, clearing them out, getting rid of old stuff. Eric came up with some great space-saving ideas. He has really been on a roll! We were supposed to have our 36 week appointment on Saturday, but our doctor was called to a delivery. This is totally understandable, but I was super bummed because I was so looking forward to seeing our baby on the ultrasound. But now we’ll go on Thursday and start the long weekend with some extra joy. 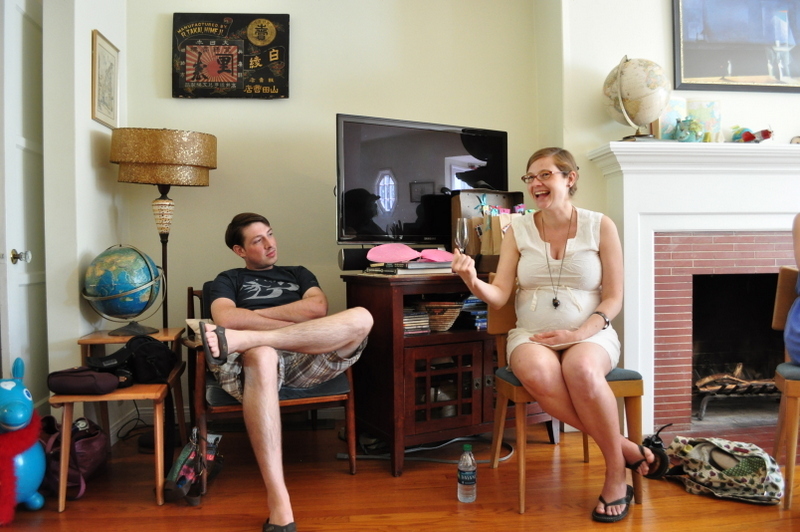 We have our prenatal meeting with our doula tomorrow, and two more childbirth classes in our series. I am going to miss those Tuesday nights. I totally adore our teacher and feel like we have learned so much. I am feeling so much more prepared and excited for the birth, and I feel like these classes have been seriously invaluable. Eric and I are also working our way through our birth books and sharing what we’re learning with each other. Every now and again I’ll shout, “Hey, remind me to blow raspberries during contractions!” or Eric will say, “Oh, I am supposed to be practicing squats with you!” I love that we’re working on this together, and so thankful that Eric is such an amazingly intuitive and calming presence in my life. Even practicing for labor with him makes me cry. I’m a lucky lady. Also! We had our Name Summit and are actively discussing names. We haven’t firmly decided yet, but it’s good to be talking through some ideas and preferences. And I think we were both encouraged that we seem to like the same kind of names. Whew! This post is so hilariously overdue. I was waiting for good light to take pictures, I was waiting to finish the quilt top, I was waiting to buy finishing materials. And then I meant to post it last night, but abruptly fell asleep at 9pm. Such is the life of a pregnant lady! In any case, I am excited to say that the quilt top is finished! I am kind of amazed at how blanket-like it is already, and I kind of can’t believe I pulled it off. 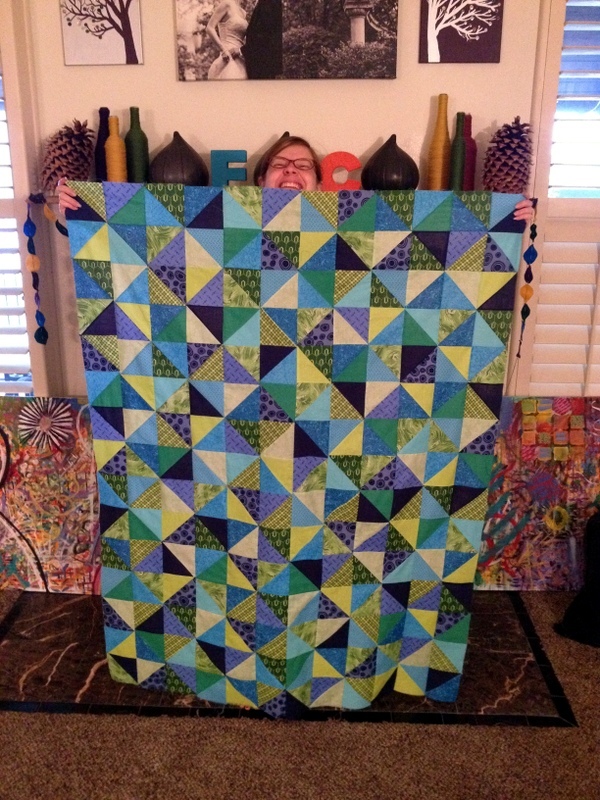 This is definitely the biggest quilting project I’ve ever attempted. But let me tell you all about my super classy quilting method. I am pretty sure this is not the way it’s traditionally taught, but I just laid out a big sheet of plastic on the floor to set out the pattern of triangles. 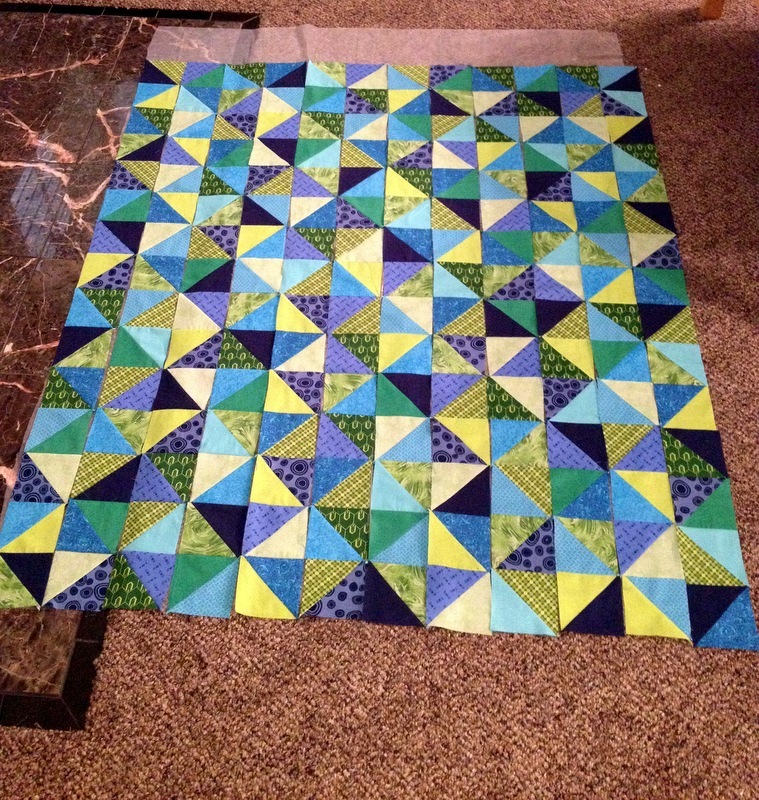 Then I sewed triangles into squares, squares into strips, and strips into one large piece. Well, that part of it is pretty kosher. But to keep the pattern the way I wanted it, I just took a lot of pictures of the fabric with my phone and consulted them every time I sat at the sewing machine. I think most people just sew the triangles and squares more randomly, but I kind of got attached to the pattern I created, and I liked doing it that way. And so I have a bunch of pictures on my phone like this one. Whatever works, right? I have so enjoyed the process. I think that my favorite part of making anything is watching a ton of little pieces of something turn into one big awesome piece. 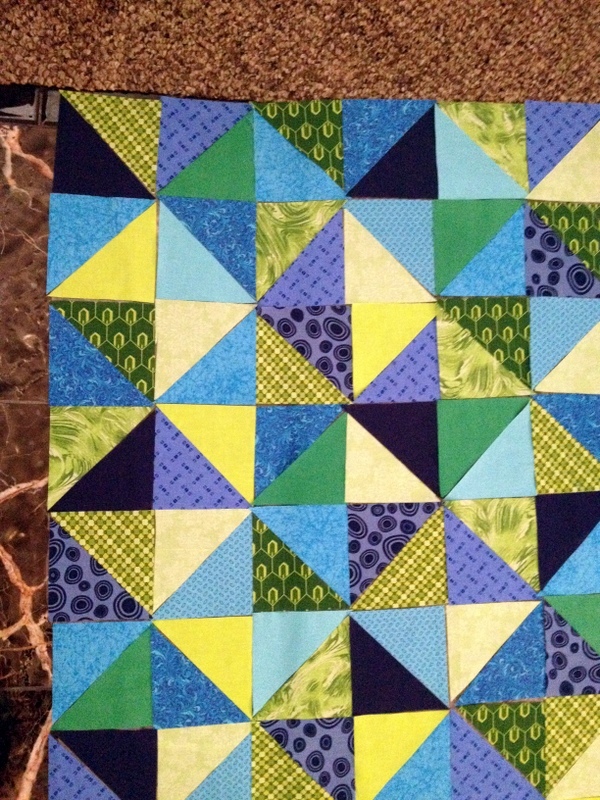 There is a lot of instant gratification with quilting. A stack of triangles becomes a stack of squares, and suddenly you’ve got strips and then a whole quilt top. Sewing the triangles was a little bit tedious, but I loved every other part of it. This week Hillary and I (and one sweet twin) went to the Big Fabric Store to get the rest of the supplies and for general merriment. I was thinking of getting a yellow for the backing or binding, and then was thinking of getting some kind of subtle pattern, but then I saw this Kona turquoise and knew it was the right one. I loved this vibrant green thread too. 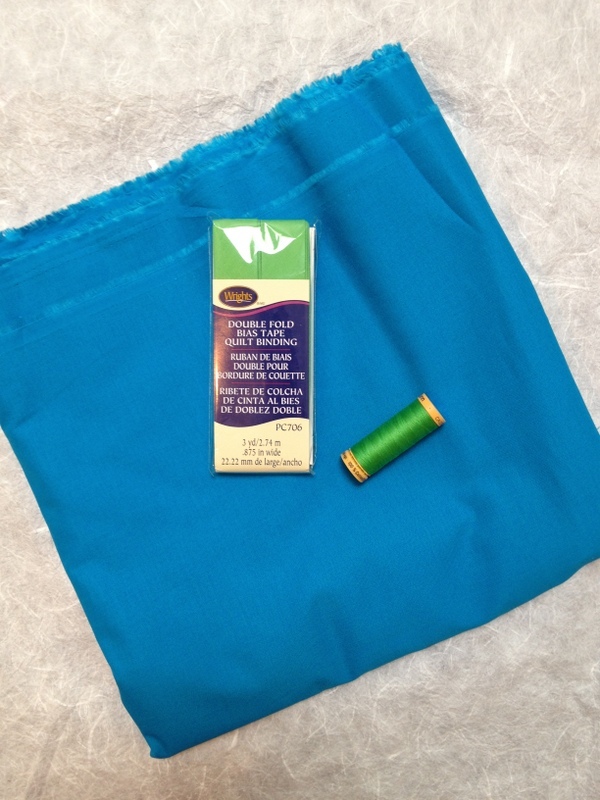 The tutorial I’m following and my quilt book both suggest buying fabric to make your own bias tape for your quilt. I can see that this would be very valuable if you wanted to use a pattern or something beyond the range of bias tape offerings. However. That is a lot of cutting in straight lines and a lot of ironing. Those are my least favorite parts of quilting (but I would take ironing over cutting any day–I’m just not very skilled at it!). 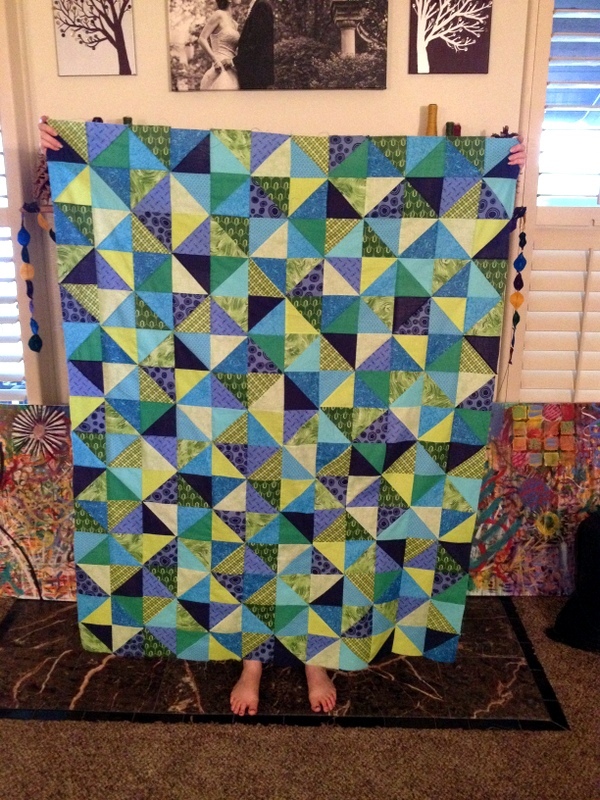 I decided that since this is my first quilt, and I have a baby coming in a month (!! ), I would cut myself some slack and use some bias tape. Luckily, I found some in a cheerful color that I loved. (Of course, there is more thread and bias tape–just showing off the colors here). It’s important to me that the quilt look vibrant and joyful, and I’m glad I was able to find colors that feel that way to me. I have a little bit of repair work to do on the quilt top (a few seams need reinforcing), but after that I’ll be laying out my quilt sandwich (top, batting, backing), pinning, and sewing! I can’t wait to hold this soft and chunky blanket in my hands. And I can’t wait to watch our little boy play on it or snuggle up with it when he gets a bit older. One of my favorite things about it is that it’s so imperfect. That said, I’m amazed that it still looks so good, given how many spots there are where the triangles don’t match up evenly. Who knows, maybe those wonky corners will become his favorite parts. And I hope that it will be of help someday in teaching him that there’s value in things that are made by hand, things that show the imperfect traces of their imperfect maker. And I hope it will help with another lesson that’s close to my heart: if you’re having fun, you’re doing it right. 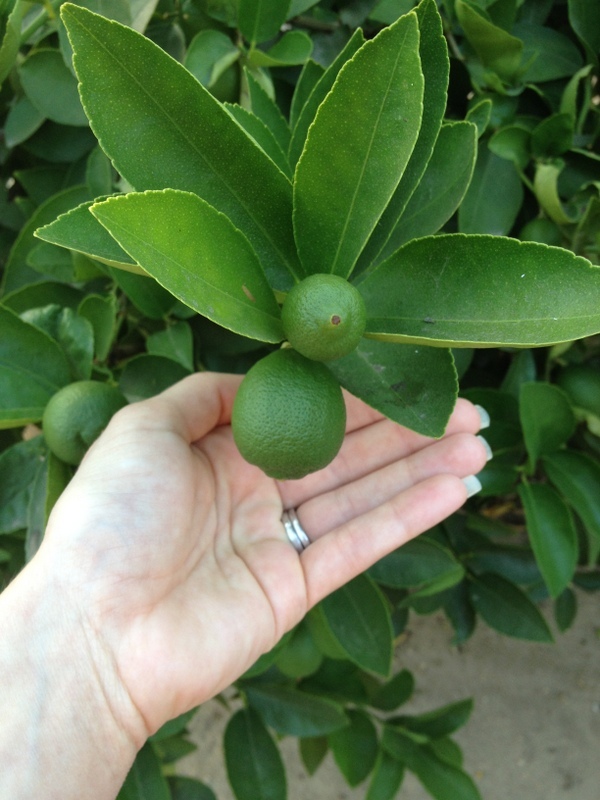 A warning: this will be a photo-heavy post because there is just so much awesome to share! And I want to brag about the many talents of my amazing friend Hillary, who threw the shower for us. Look at this adorable display! And also, I just want to remember as much as I can about this special day, which I can only describe as completely luminous, filled with love, and one of the happiest times I can remember. We are so lucky to have such wonderful people in our lives! 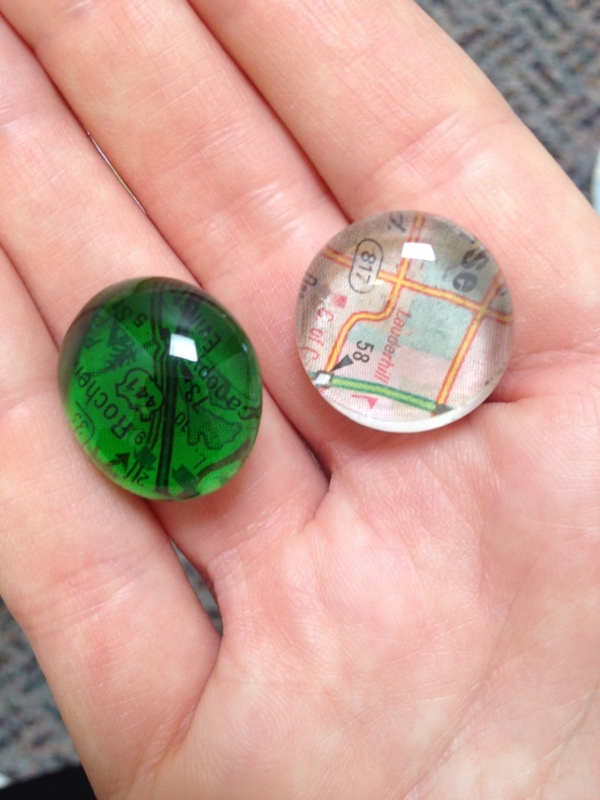 Hillary and I worked together to make the map bookmarks (more on those soon), but my jaw dropped when I saw all the other things she had added to the party favors. 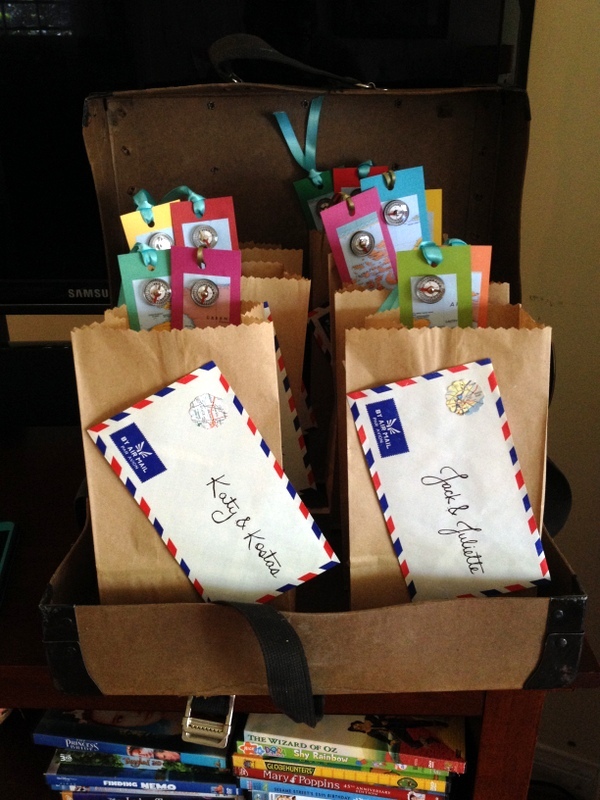 These adorable bags with their own air mail tags, and map coasters and magnets! And yes, they are nestled in a suitcase. 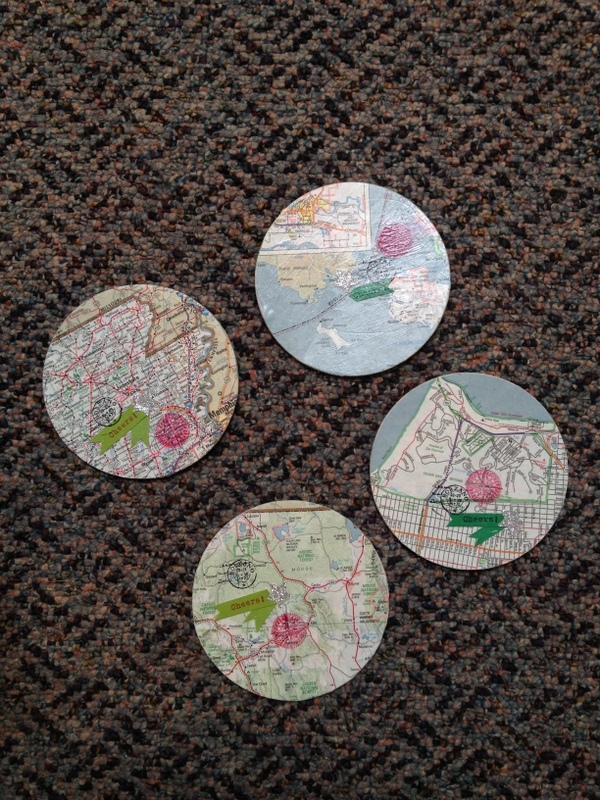 The coasters were a total surprise, and I think everyone’s were specific to them. Ours featured Memphis, San Francisco, and Russia! These are a few of the magnets. Aren’t they awesome?! Hillary has promised to show me how to make them. We had been planning and working on crafts for the shower for a few weeks, and on Friday we went on a huge Costco run to get the food. 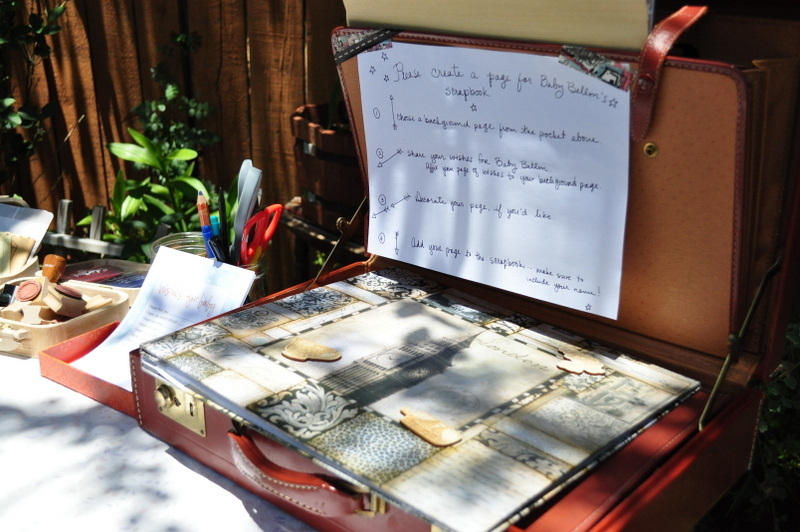 I had no idea she was planning anything else, and I have no idea how she found the time to do it on top of the regular party prep, but feast your eyes on this: a customized scrapbook station for the baby! This just totally blew me away, and I was so incredibly touched by it. 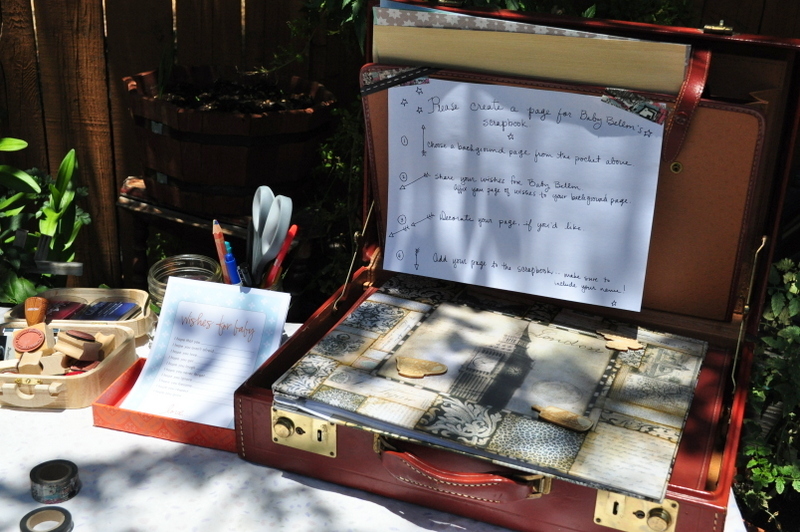 The pages all had maps and travel themes, and the scrapbook (in the briefcase) was so perfect. I treasure every page, and it is so sweet to have these wishes for our baby. I can’t wait to show them to him someday! Hillary’s girls made pages too, and they were so very sweet. But let’s rewind to the beginning of the party! 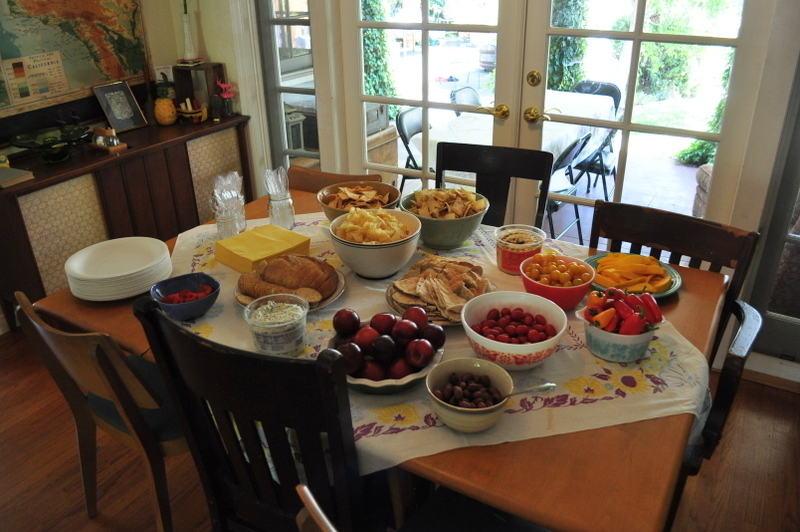 Here is the spread, but only in part. There was so much more, and I am not ashamed to say that I ate a LOT of it. 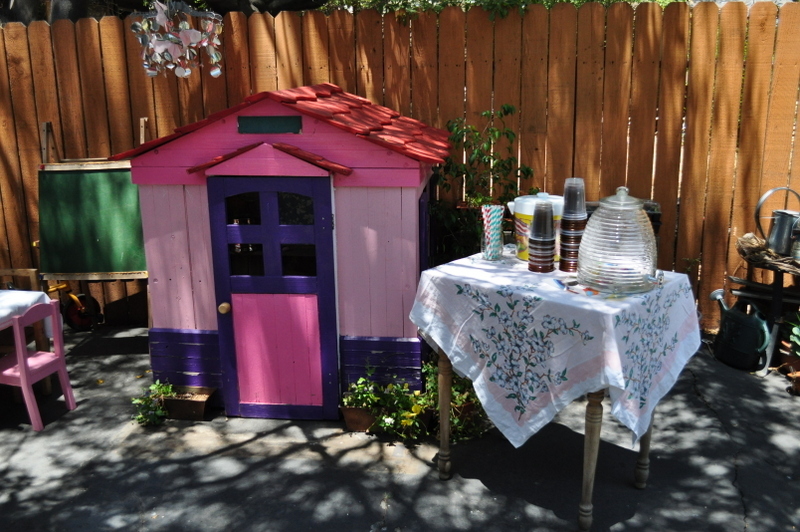 This is the lemonade stand, next to the girls’ playhouse in Hillary’s glorious backyard. 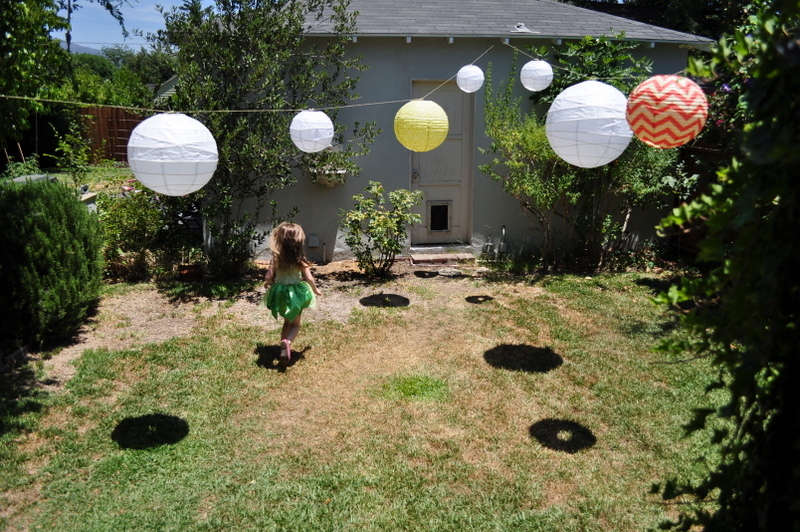 A certain princess enjoyed stomping on the shadows of the lanterns. 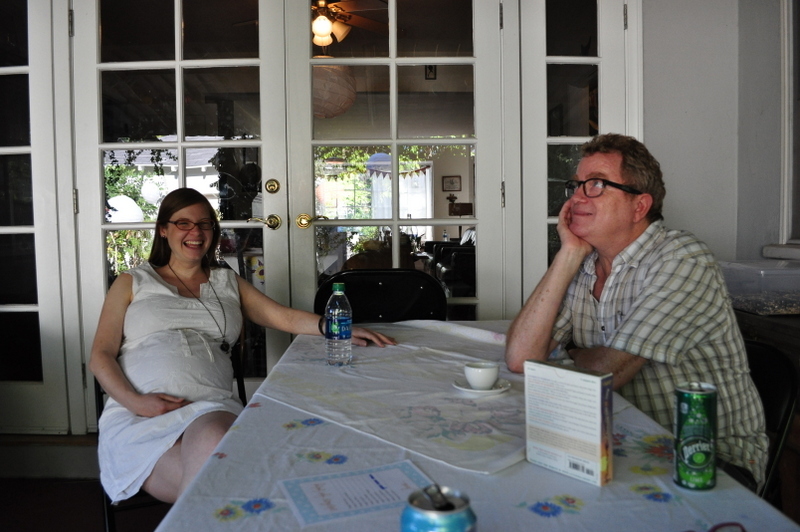 Our awesome friends Jack and Juliette, who we are thrilled to have as our baby’s godparents. 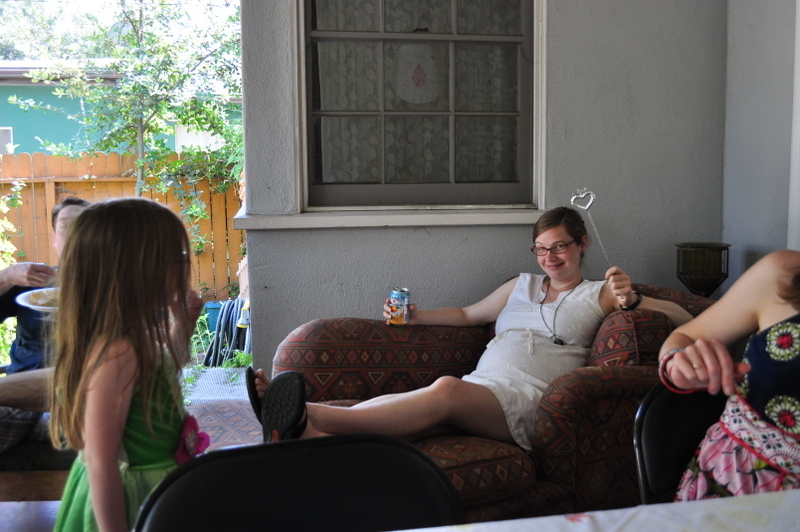 Hillary suggested that I sit in this chaise lounge and hold court as queen, and I was happy to oblige. 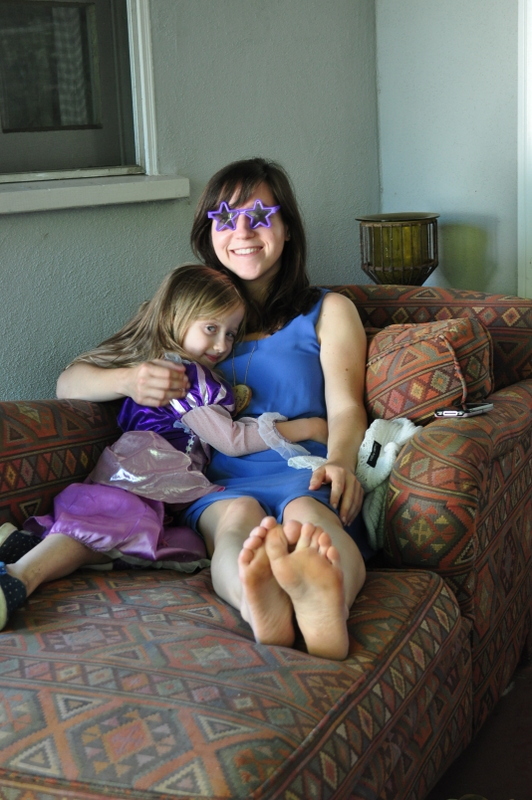 Some kind princesses even lent me their wand. 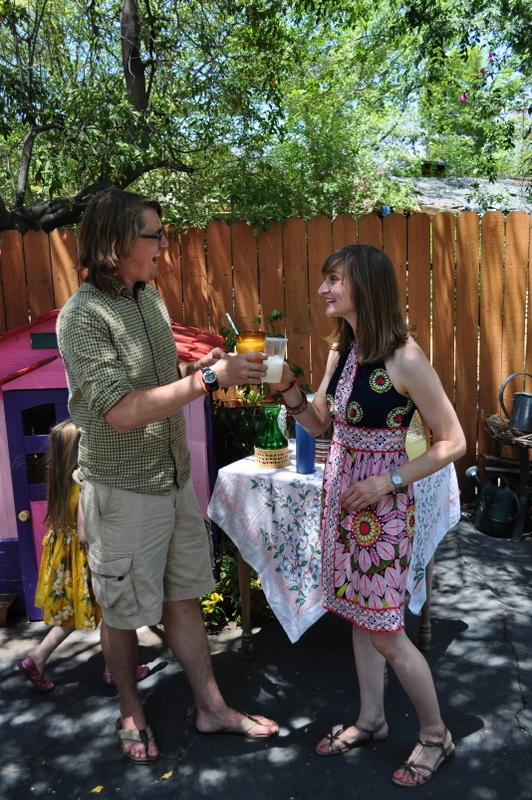 Revelers enjoying the beautiful backyard. I wore this beautiful white dress that Hillary lent me. 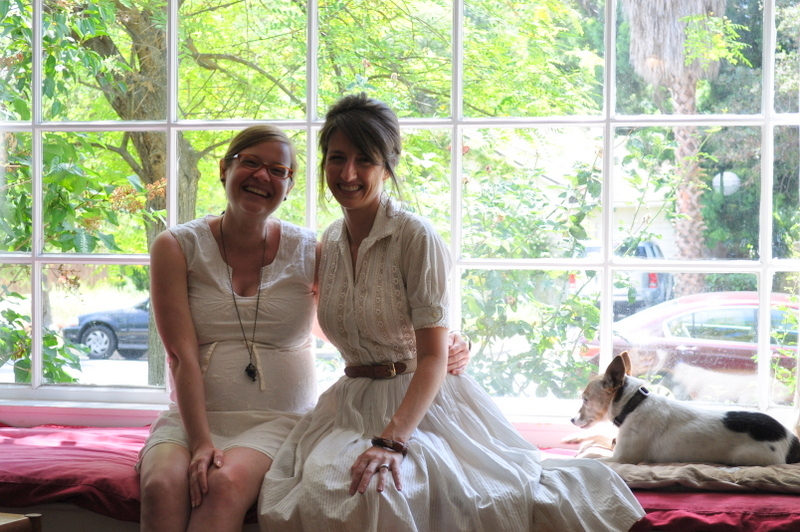 Two ladies in white! Isn’t she lovely? The present pile! Please note that awesome Katie made us a decorative newspaper baby, complete with umbilical cord. I loved it. 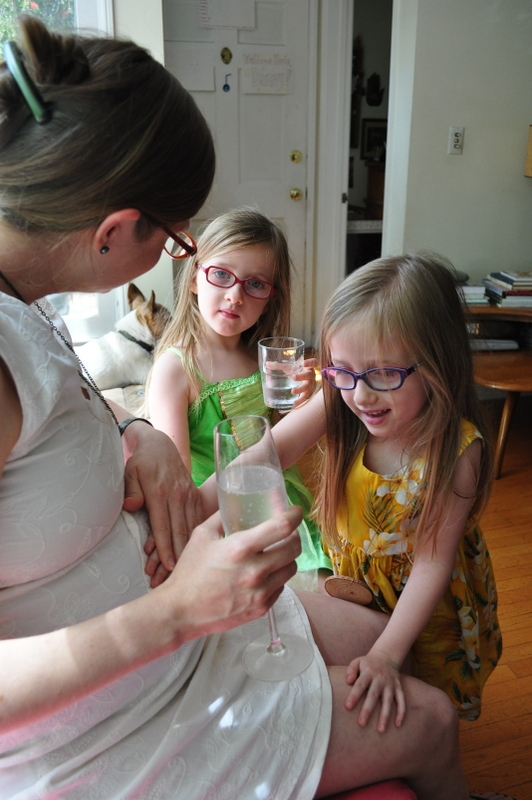 Everyone came inside for the (sweetest ever) champagne toast (and sparkling water for me), and the girls got to feel the baby move. 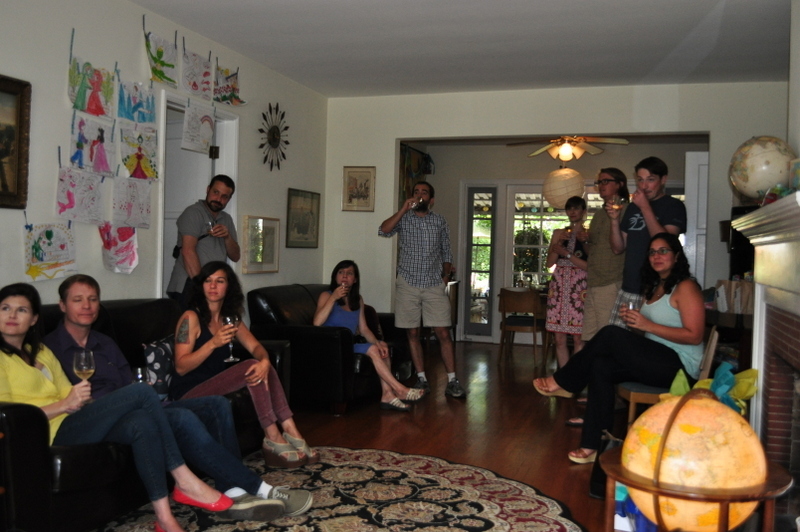 All our beautiful friends, and my favorite in-home art gallery on the left. 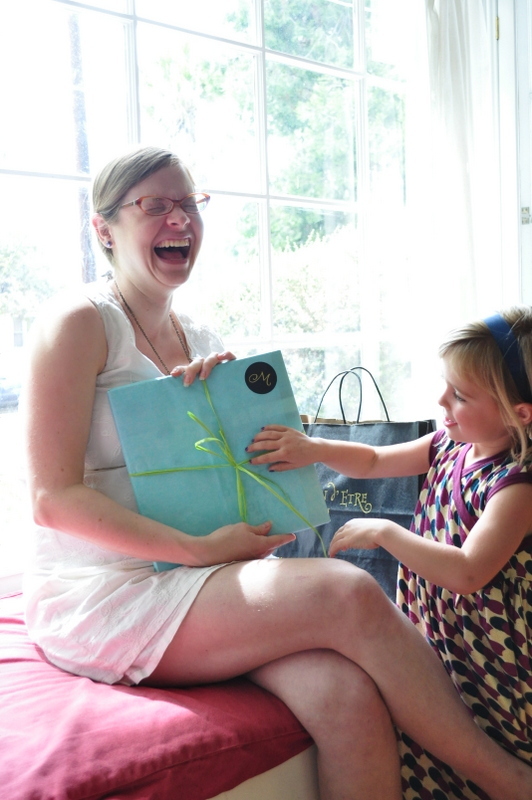 We received so many thoughtful and lovely gifts, and the girls were my expert helpers in unwrapping. They made me laugh too. A lot. A new addition to the baby’s library. 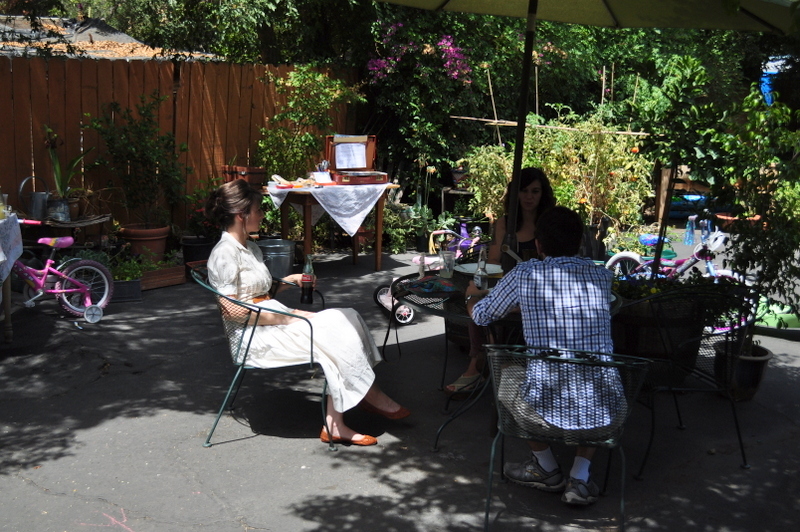 After the festivities, Eric and I and Katy and Kostas stayed for some afternoon relaxation. The girls just fell in love with both of them, and I cannot blame them one little bit. Proof that Danny is always, always making me laugh. These are my people. I love them so much. 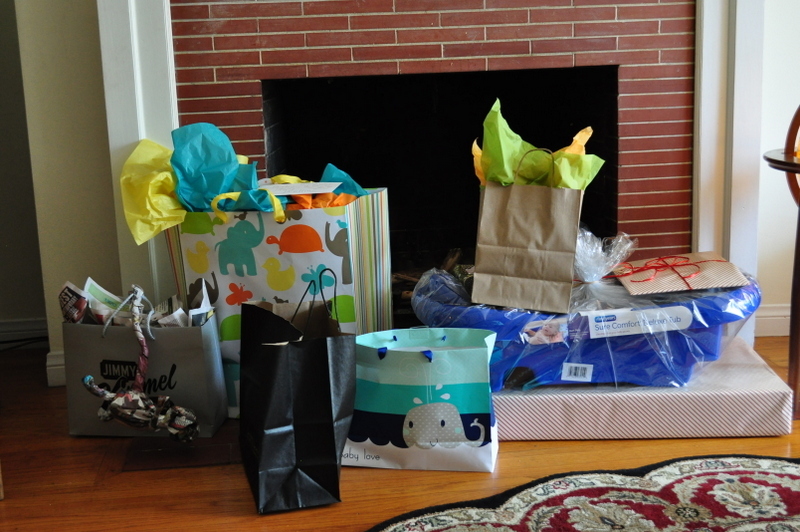 I always thought that the term “shower” referred to a shower of gifts for a baby or a bride-to-be, but what I understood after Saturday is that it’s really a shower of love. I was just totally awash in gratitude and wonder that we have so many incredible people in our lives, and that they all love our sweet baby so much, even before he’s here to charm us with his little smiles and laughs. Each person who came made the day so special, as did everyone who was there in spirit. All I can say is thank you, thank you, one million times thank you. Thank you for loving me, thank you for loving Eric, thank you for loving our sweet son. I am more grateful than you’ll ever know. 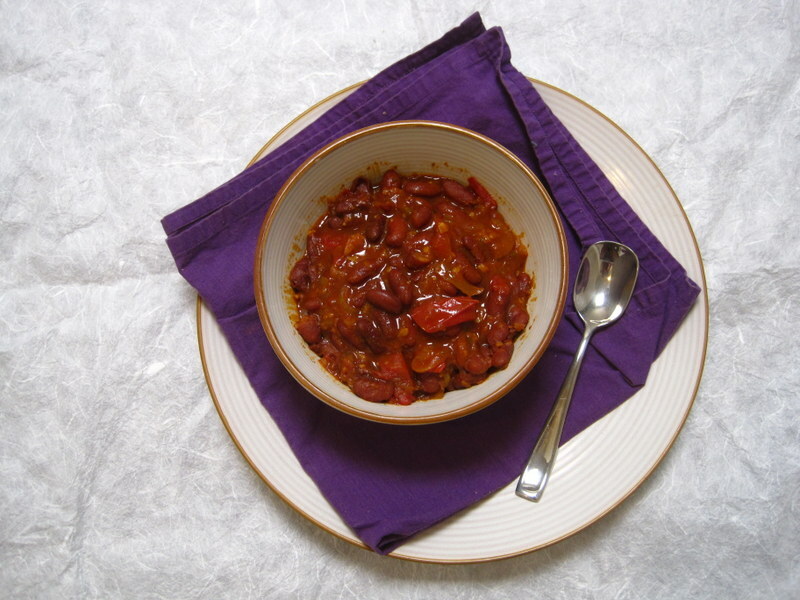 I am writing this post in the afterglow of the most wonderful weekend. Our dear friends Katy and Kostas came down from Berkeley to stay with us, and we had the baby shower at Hillary’s on Saturday. I will share shower pictures tomorrow, but honestly, it was just so overwhelmingly wonderful. So many fantastic people, so much love in one space. Everyone who was there means so much to us, and we had such an awesome time catching up with them, eating delicious food, and laughing about anything and everything. It touches my heart so much that so many people love our little baby even before he is here with us. This week was a busy one, punctuated by several car mishaps, which definitely led to some hormonal crying jags. However! It has mostly all been taken care of, and crying always makes me feel better. My ankles are definitely swollen this week, but getting better some days. Walking helps, as does swimming. We went to the pool today, and as I glided like a blimp into the wall, I told Eric that I felt like a hippopotamus. But a graceful one! I am slooooow, but I feel like breaststroke is very helpful for the swelling. And this is very convenient because it is the only stroke I can still do. The funniest thing to me is that there isn’t anything physical about this pregnancy that has really bothered me yet. 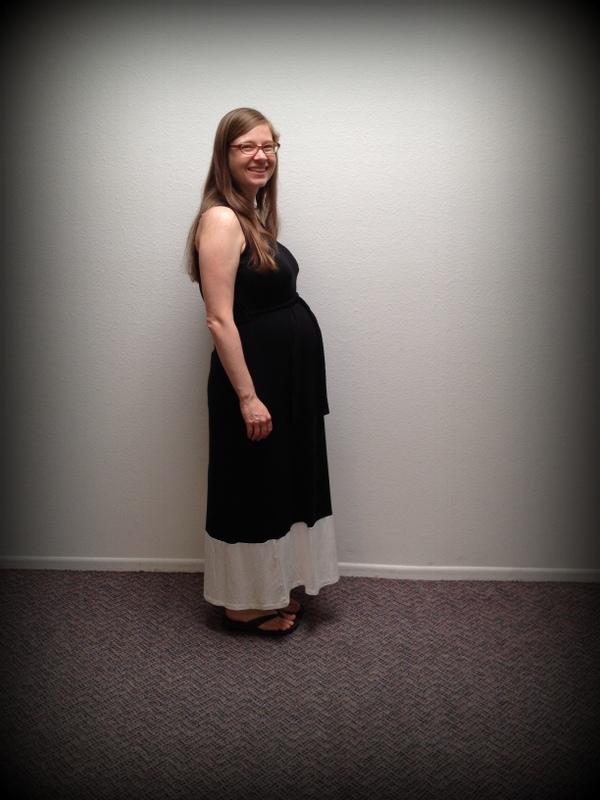 Well, I was not a fan of the first trimester, but I love my big belly, and I don’t mind a single pound I have gained. My arms are thicker, and my face is fuller, and I do not mind in the slightest. But when I noticed that my ankles were swollen, it just totally weirded me out. I called my mom and told her that I have Shrek feet! And she laughed. After I broke a pair of my flip flops this week, I bought a new pair at Walgreens for $3, and they make me feel like I’m walking on a cloud. So comfy! And, by the way, given the direction my feet are going in, I decided to go ahead and take off my rings, before it’s too late. Eric said to watch out, since hitting on pregnant ladies is a big thing. Ha! 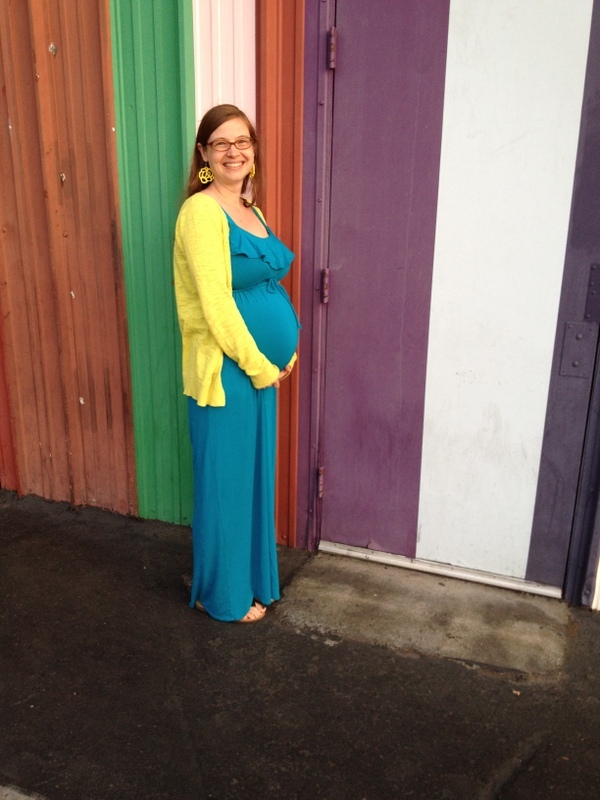 My sweet cousin Laura, who has two boys, told me that she wasn’t really uncomfortable until 34 weeks in her pregnancies, and I started to understand that a bit last week. My feet were hurting, the heartburn reached a new level, and I kept finding myself wanting to go to bed at 8pm. But I still wouldn’t say I am really uncomfortable, which is good, since I have five weeks to go. 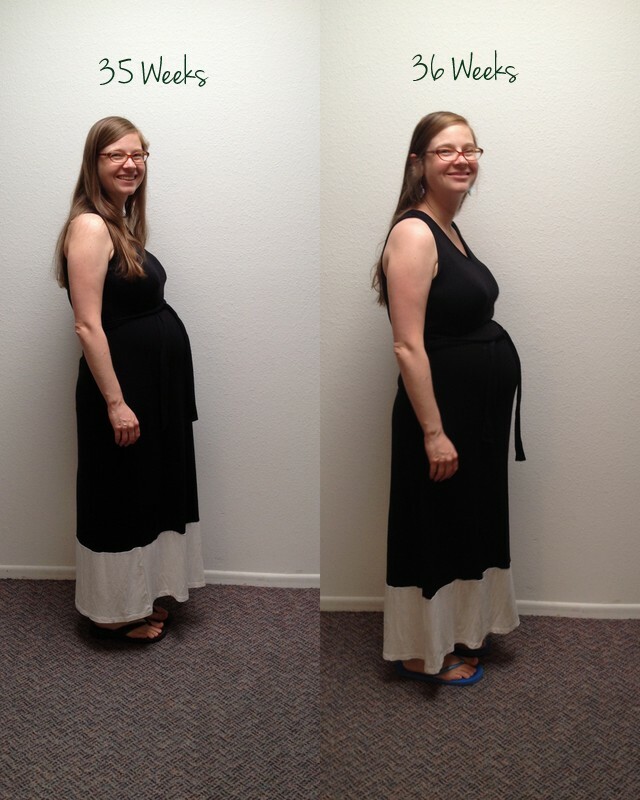 My belly for sure gets in the way of some things, but I am so happy that I am still able to move easily and walk comfortably. Also, I finally broke down and did some maternity shopping to add to my meager collection of things that still fit me. 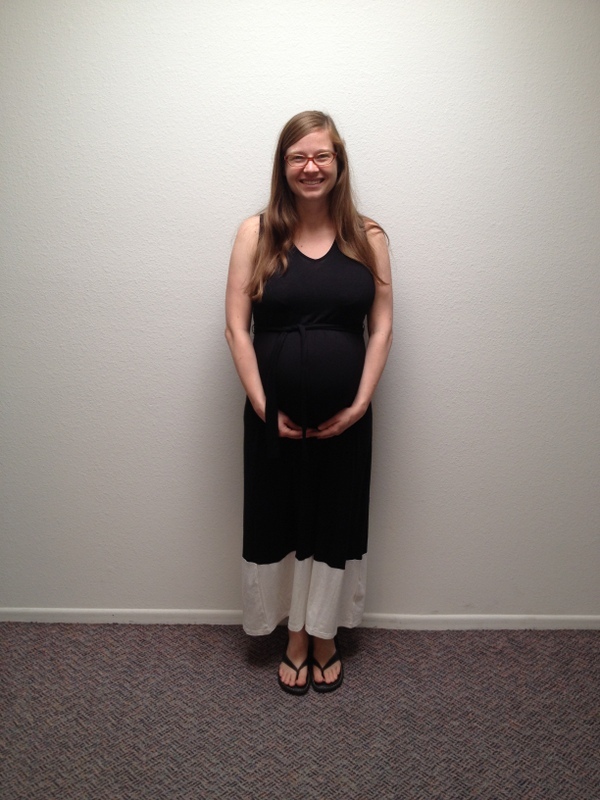 Ironically, my constantly falling-down maternity jeans now fit me, but…it is way too hot for jeans. I got this black and white dress and a good handful of shirts to go with my skirts and shorts, and I hope that will hold me, at least for the next few weeks, after which: muumuu time! Our sweet baby is kicking and wiggling almost all the time, and I love feeling him move. One morning this week he was especially quiet, which made me a little nervous. I had Eric talk to him and play some music on my belly, but still nothing. Finally I leaned forward (his least favorite position), and I felt a little kick! He’s been kicking almost non-stop since then, which I do not mind in the slightest. In fact, as I am typing this, he is wiggling from one side to another. My belly is rather hilariously lopsided, and I love it. 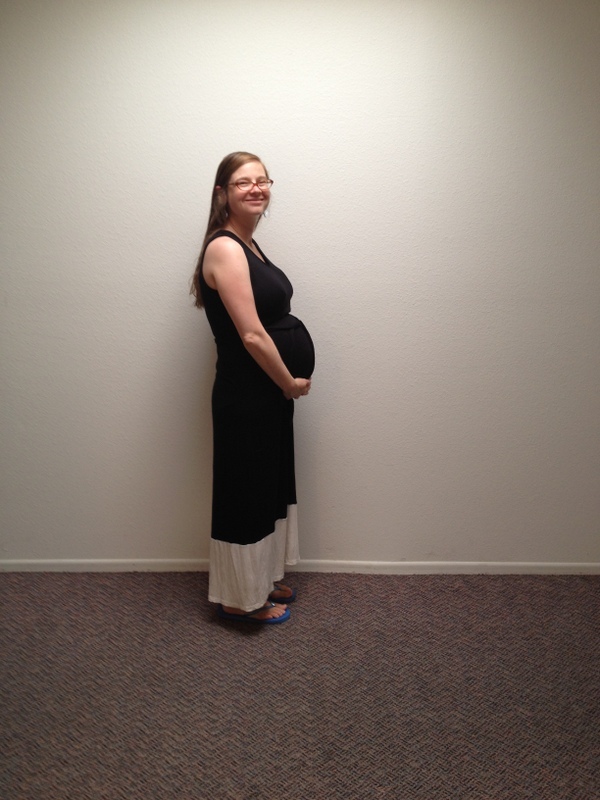 This weekend we’ll have our 36 week appointment and an ultrasound to check his position. We haven’t seen him since 20 weeks, so I am beyond excited. And beyond excited to hold him in my arms in a little more than a month! But the best thing Hillary gave me was her friendship and the gift of a place in her life. It is really a special magic to find someone who loves all the same things you do, and on top of that is overflowing with kindness and wit and wisdom and joie de vivre. Soon we were having craft nights (and crafternoons!) 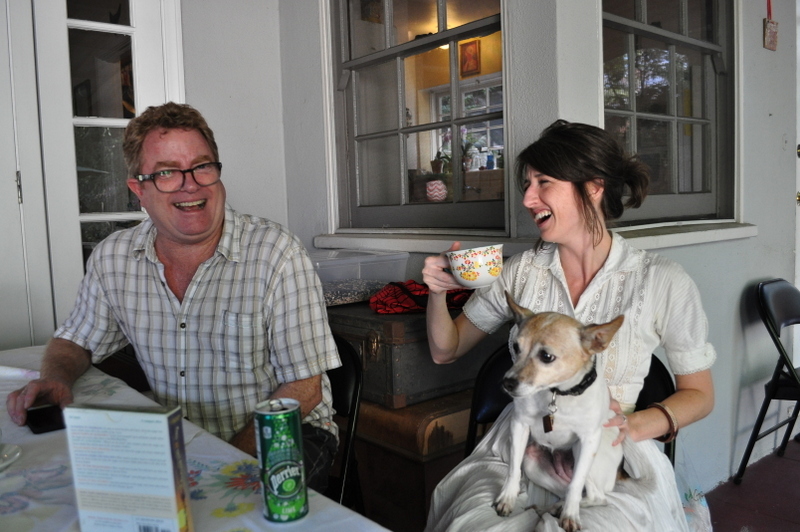 and picnics and going thrift store shopping and scheming about how to bring our grand artistic ideas into fruition. We took (the most fun!) road trip, had a good handful of pool dates, and I became a regular with her, dropping off and picking up the girls from school. We celebrated Easter and Thanksgiving together with our families. I came along to the girls’ dentist appointments, and Hillary got a babysitter so she could come with me to my glucose test. 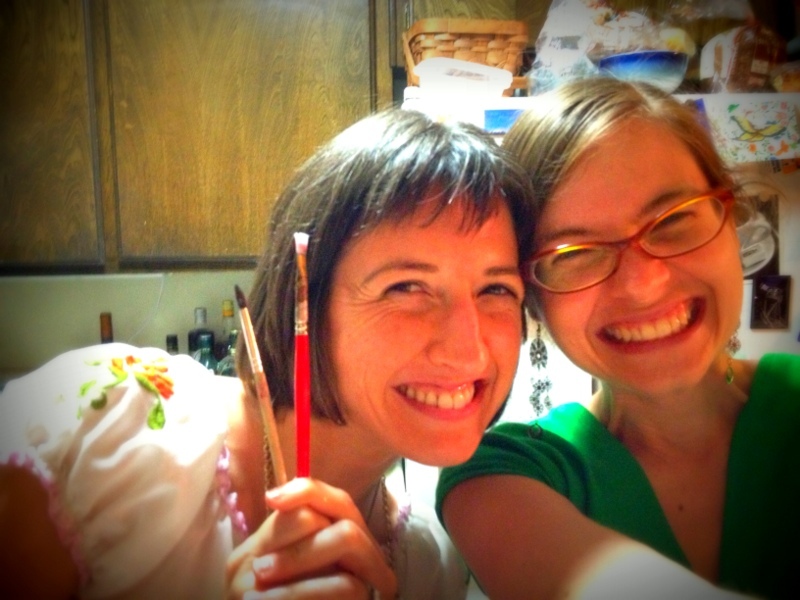 We took a painting class together, shared so many delicious meals, and talked and talked and talked (and laughed!) about anything and everything. There are people you meet later in life and wish you’d always known, and that’s definitely the case here. I kind of can’t believe we’ve only known each other for a year because we are already family, and I can’t imagine my life without her, or her wonderful daughters and hilarious and kind husband, who also happens to be an amazing cook. She’s my favorite thing in Pasadena. You know the kind of friend who makes everything fun? Like even a Costco run or a cleaning session? That’s the kind of friend Hillary is, and I thank my lucky stars for her. I think you really only get a few friends like this in life, enough to count on one hand. 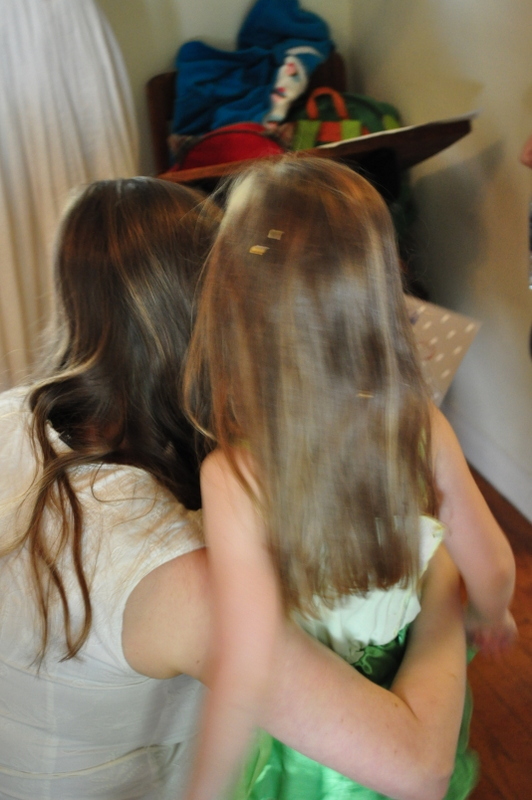 I hold onto my little friend bouquet extra tightly, and extra gratefully. I love that today, one year later, we are going shopping for food for the baby shower, which she and her family are throwing for us. I have no doubt that, like the 365 previous days of our friendship, it will be a raucous good time! Friendship, like love, carries within it all the richness and joy of life. This one has been a gift straight from heaven, and I am so thankful for it. Blissful is definitely the best word for these past three years. I can’t type that without smiling. Being married to Eric has been the most fun I have ever had in my life. What other adjective could you use to describe getting to hang out with your best friend every day? I still jump up to hug him when I hear his key turn in the lock. He’s my favorite. I have been thinking for months that that’s the perfect word to describe Eric. He is just so good, in every way. He is so compassionate and patient and intelligent and funny and caring and faithful. A friend of mine from college happened to go on a date with Eric before we were dating, and Eric told me about it as soon as he realized that we were friends. When I told her I was dating him, the first thing she said was, “Oh, he’s very upstanding!” And yes, he is. I love that about him so much. And I love the everyday part of being with him. I love being part of this team, I love making decisions together, I love discussing our days over leftovers. I love going to the farmer’s market every Saturday and walking down to the gym together. I love tag-teaming the dishes and having lazy afternoons. I love fancy dinners and romantic getaways and flowers and surprises too, but it’s this everyday building of a life together that I really cherish. This isn’t to say that there haven’t been hard times in the past three years, but, thankfully, they made us even closer instead of driving us apart. We’ve had our fair share of illnesses and stresses and all the other things that are just a part of a life, and every time we have said, “There’s no one else I’d rather go through this with than you.” When I think about the things that Eric has patiently seen me through, I can’t help but cry. He is seriously the most dedicated and supportive person I’ve ever known. I can’t wait to see him as a dad. I know I’m going to fall in love with him all over again. Happy anniversary, baby. Here’s to so many more! Tomorrow is our three year anniversary. Hurray! 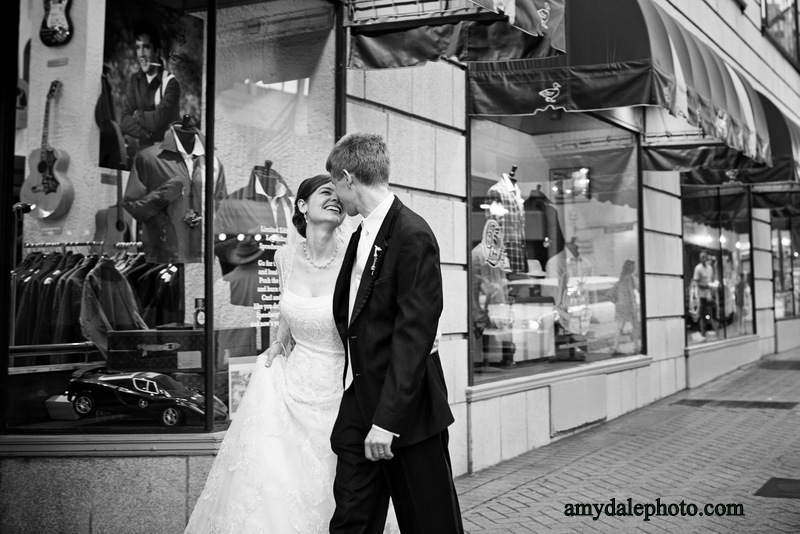 I am going to write a special post about it, but for today I wanted to share our wedding slideshow. It’s not a slideshow of our wedding, but a slideshow of our two separate lives and how, blessedly, they came together six years ago. I kind of can’t believe I didn’t think to share it earlier, but here it is. It still makes me cry. Love is one of those great mysteries, not only in a cosmic sense, but also in a logistical one. For every two people who have found each other, it’s impossible not to wonder at the chance meetings, the small decisions, the seemingly random events that brought two lives together. It’s a beautiful thing to reflect on, everyday magic. But what fills my heart even more than that when I watch this slideshow is an overwhelming sense of gratitude to the people in our lives, both friends and family, who helped shape us, who helped bring us together, who have loved and supported us as a couple and as individuals. Thank you. 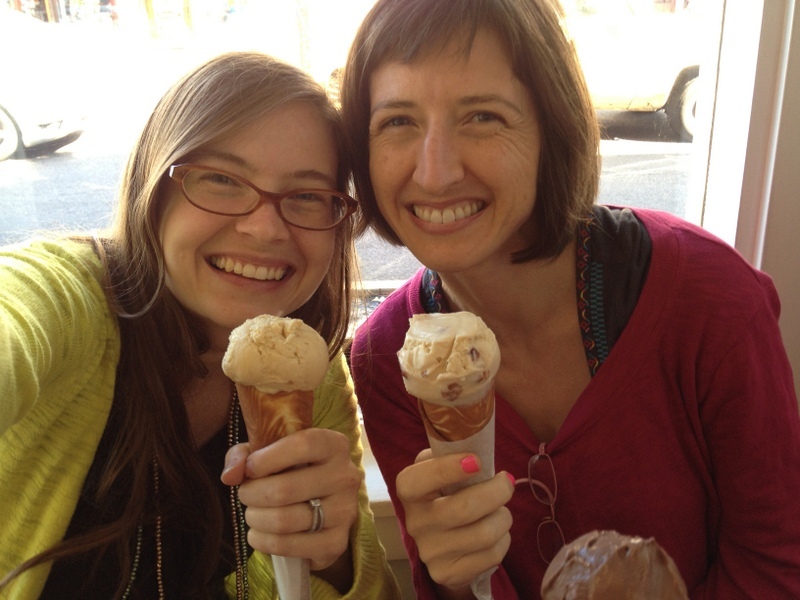 Thank you so much to all of you, who have made our lives so richly joyful. We love you! Well, this has been a big week! Big being the operative word here, of course. 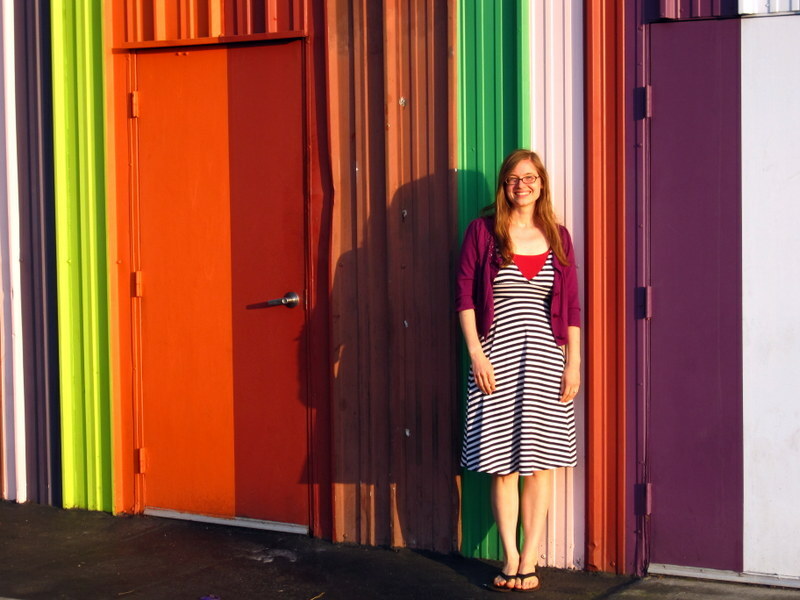 (Yes, I am totally wearing the same dress I wore last week. It is my most beloved tent. Don’t fear–I wash it! Often!) We had our hospital tour on Wednesday, and it was awesome. The hospital is really lovely and calming, but more importantly, everyone was so nice and so supportive of natural birth. The hospital actually has some policies in place that make it easier to have a natural birth if you want one, and I was so excited to hear about them. The rooms in labor and delivery are just huge, and there’s a private garden for women in labor to walk around. Um, that is amazing. 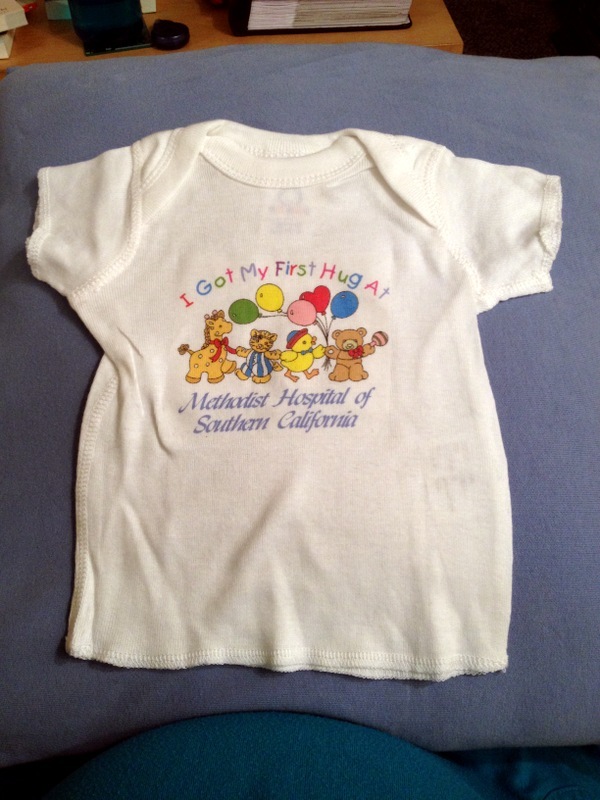 And we won this tiny t-shirt for our baby in a raffle. Honestly, it was just such a pleasant experience, and we feel very positive about where we’ll be delivering. That is worth its weight in gold. Or in anything else of value. Like strawberries. Or peaches. Or really cold water. Those three things are my currency these days. On Friday we went in for our regular appointment, and we went over our birth preferences with our doctor (it’s a form we’ll take with us to the hospital). She was on board with our wishes and was very supportive. Huzzah! But the best news is this. I asked her if she could tell what position the baby was in, and she said, “Oh, his head is already down.” And my jaw dropped, and I said, “Really?! That is the best news I’ve ever heard!” Never say pregnant women aren’t melodramatic. He is not really in position yet–his head is down, but his body is still curled up a little bit. But that is still such fantastic news! I think he turned sometime around Wednesday, and Eric said he could definitely see a difference in the shape of my belly. Hurray! I hope he’ll stay this way, but we’ll have an ultrasound in a few weeks to confirm his position. A huge weight off my shoulders! What else? I am still very active, but I am slooooowing down. My range of motion is becoming more limited, and my feet really hurt. They are carrying an awful lot more weight than usual. I don’t think they are swollen (yet? ), but they are definitely worn out. When I get up in the middle of the night and my feet hit the floor, they’re like, “Wait, you want us to do what now?! We’re off the clock!” I noticed today that my rings are feeling more snug, but I also had a lot more salt than usual this weekend, so hopefully they’ll be back to normal in the next few days? (All you experienced moms, feel free to cackle at me!) Otherwise, I have no real complaints except for heartburn. And that’s not really a complaint because Tums forever! This weekend we took a quick little trip about an hour south for our anniversary. It was great fun, and I will write more about it this week for sure, but I had to share this picture. We ate dinner at the same restaurant two years ago for our anniversary. I look so different now! I think maybe we can add my face to the list of things that are potentially swelling. Ha! I am really used to working from home. 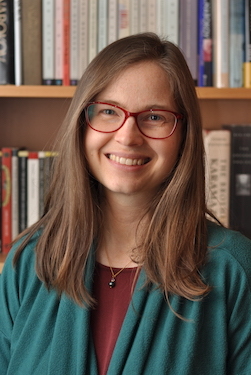 Grad school will do that you, and a dissertation will drive it home (ah, those cold mornings I spent researching at my kitchen table in Berkeley, with a hat on!) Writing, the kind of writing I do now, lends itself well to this way of life too. Over the last ten years, I’ve become so comfortable and cozy at home, putting together rhythms and routines that work for me and switching them up every couple of months when they get stale. I love getting out and about, but home is my base, a place of books and warm Earl Grey (in a few months!) 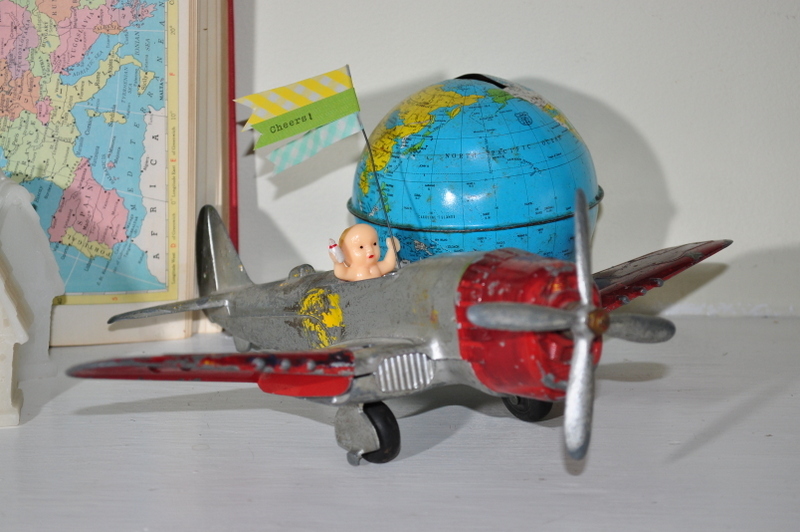 These past few months have been busy ones, though, and every day there are places to go: checkups and appointments, grocery runs and other household errands, and all manner of baby prep. Also, I would probably go crazy if I didn’t get to hang out with Hillary at least twice a week. So these days, a whole day at home is a rarity. It happens once every few weeks, and I love it. My home days feel expansive as they stretch out before me, and I often find that I have more focus if I know I won’t have to stop working to go somewhere. On home days I write and I research and I clean and I play with my toys: paint or paper, fabric or felt. I get things done that I have been meaning to tackle for weeks. 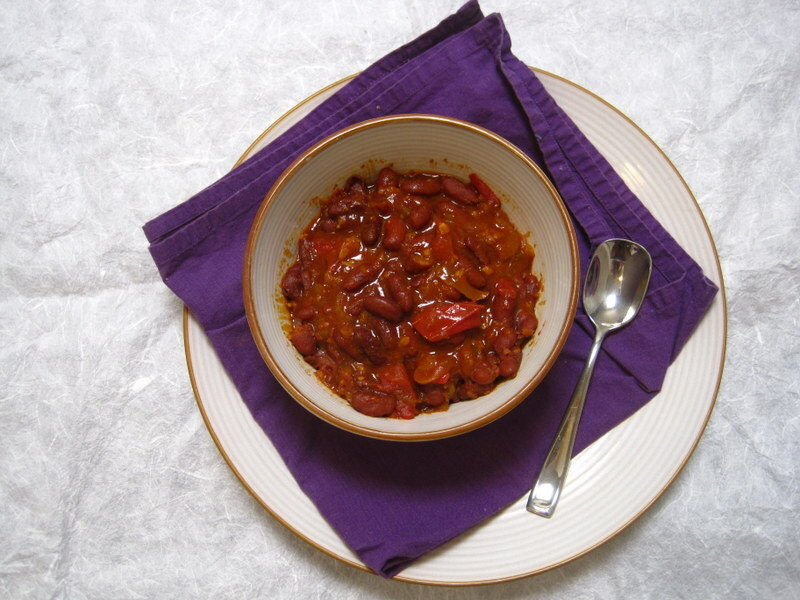 I take time to read and have Skype dates and cook (well, I cook almost every day anyway because I am a pregnant T-Rex, but I enjoy it more when I don’t have to be rushed.) These days are so restorative, and they leave me ready to rush out to a prenatal appointment or a birthing class or even the farmer’s market. I always make sure to get out for a walk or a trip to the gym in the evening, and the whole world feels new: the brilliant blue of the sky, the gentle whisper of leaves in the wind, the shadows of palm trees dancing at my feet. I think that I’m extroverted by nature, but as I grow older, I find more introverted traits developing in myself, and I kind of love it. A new branch growing on an old tree.